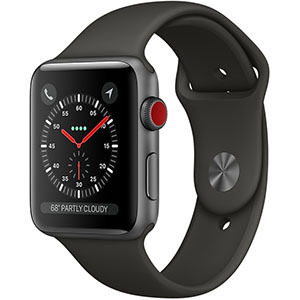 Apple Watch Series 3 (GPS + Cellular) devices, which were introduced on September 12, 2017, allow you to stay connected even when away from your phone. From making calls and sending texts to streaming music and receiving notifications, Apple Watch Series 3 Cellular models feature built-in GPS and GLONASS. With a 16GB capacity and up to 18 hours of battery life, the Series 3 Cellular line comes in two case sizes: 38mm and 42mm. Series 3 Cellular cases also have a ceramic back with Ion-X strengthened glass and run watchOS 4. Starting at $399 (USD), Apple Watch Series 3 devices support Bluetooth 4.2 and offer up to 18 hours of battery life. Equipped with a W2 chip, the watches are also equipped with a heart rate sensor, accelerometer, gyroscope and barometric altimeter. Although the Apple Watch Series 3 (GPS + Cellular) delivers cellular connectivity independently of your iPhone, it must share the same carrier.